Outfielder Jonathan Davis is ready for next season after a decent showing in Arizona. Maintaining a .295/.389/.410 slash line in 78 at-bats with the Peoria Javelinas; was a great indicator that Davis is ready to make a major push towards the big leagues next spring. Thankful for the opportunity the Blue Jays’ gave him down in Arizona; Davis took a moment to remember everybody that has supported his career to date. His opportunity came after a strong showing with the double-A New Hampshire Fisher Cats. Recording 111 hits with 20 doubles, four triples, and 10 home runs in 446 at-bats; was a great way to kickoff his double-A career. A major contributor to his production has been his dedication on improving his plate approach every season. Part of adjusting to that pitching was being able to hit off-speed pitching more consistently at the double-A level. But Davis has done more than just adjusting to better pitching. He has also sharpened his defensive game every season. His hard work paid off in New Hampshire in 2017, as Davis maintained an impressive .994 fielding percentage in 1052 1/3 innings amongst the three outfield positions. Despite the improvements he has made since turning pro, Davis is remaining humble and focused on improving everything next season. 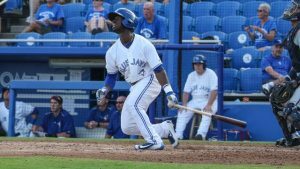 Toronto Blue Jays fans certainly hope Jonathan Davis can continue to keep that mindset heading into 2018, as he looks to earn another promotion in their system. He has truly developed better than anyone really expected and seems to continue regardless of the level…looking forward indeed to seeing him at the major league level.